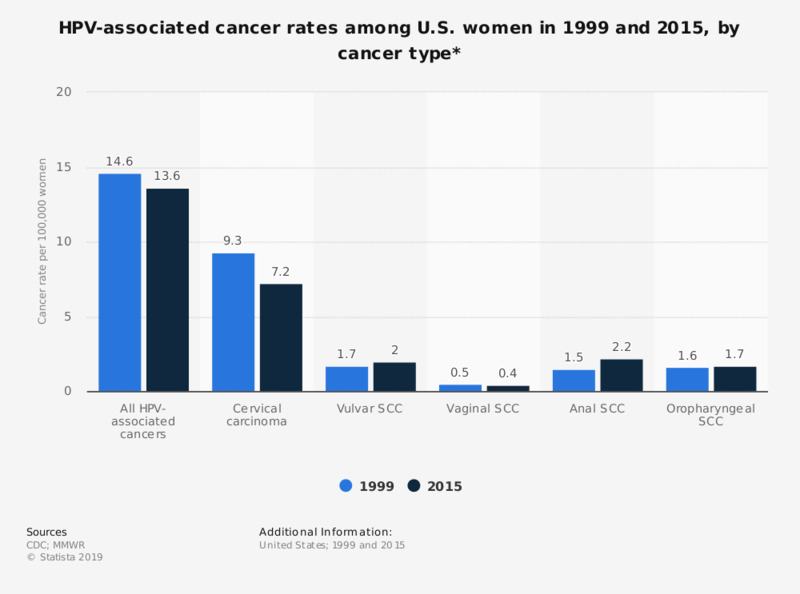 This statistic depicts the rate of HPV-associated cancers among U.S. women in 1999 and 2015, by cancer type. According to the data, the rate of cervical carcinomas decreased from 9.3 in 1999 to 7.2 in 2015. * HPV-associated cancers were defined as cancers at specific anatomic sites with specific cell types in which HPV DNA frequently is found. All cancers were microscopically confirmed. Everything On "Human papillomavirus (HPV) in the U.S." in One Document: Edited and Divided into Handy Chapters. Including Detailed References. Statistics on "Human papillomavirus (HPV) in the U.S."